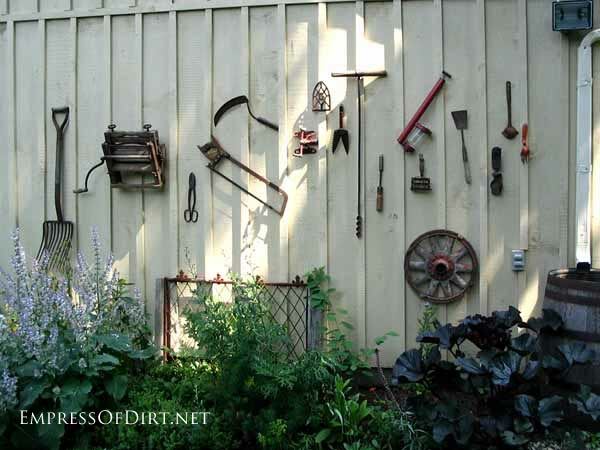 Want garden fence ideas with garden art ideas? 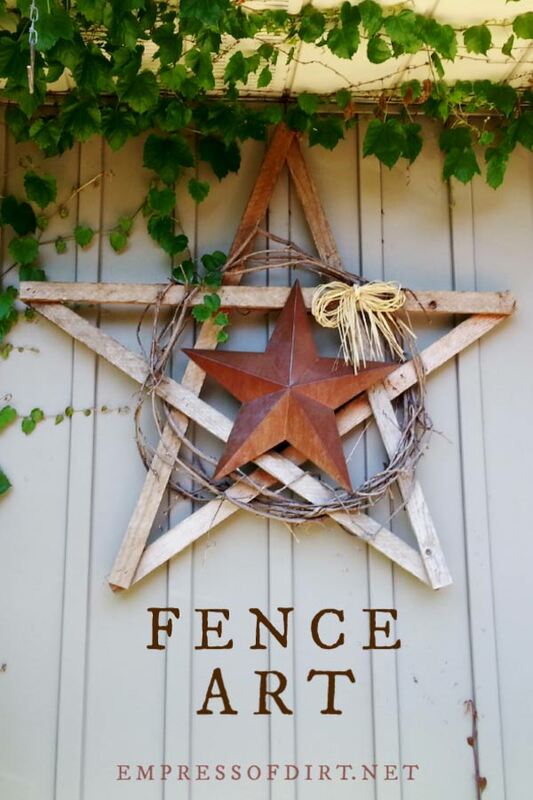 These fence decorations are great ways to dress up your outdoor space. 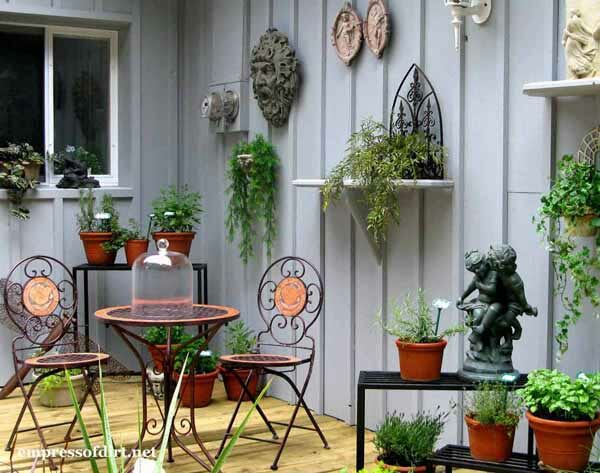 If you’d like specific ideas for privacy fences, I’ve got a collection of them here. 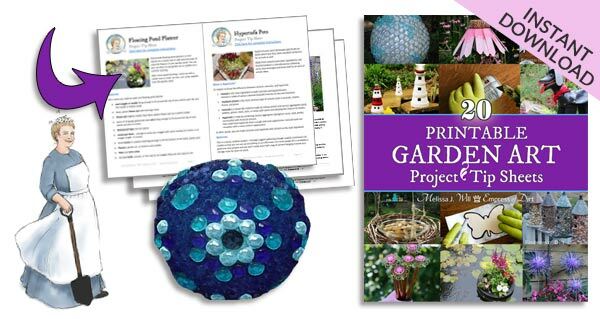 I go on local garden tours to gather ideas for my garden. 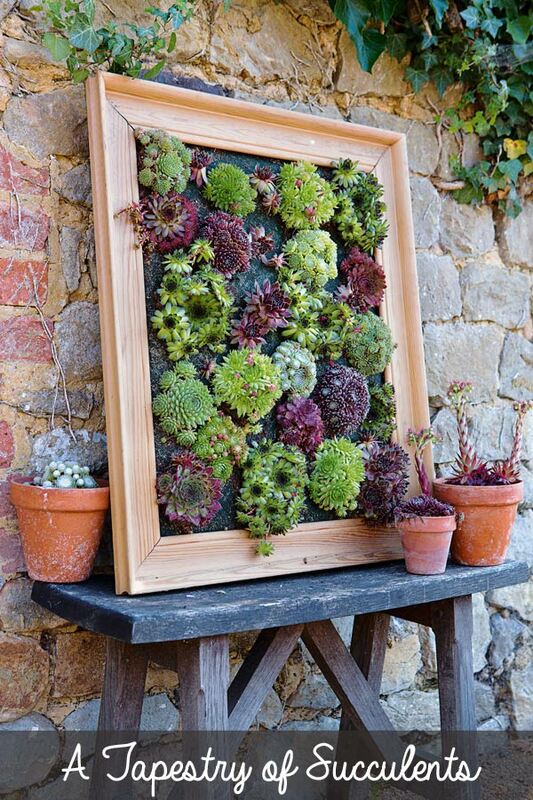 There’s all sorts of incredible but expensive garden art you can buy these days in floral shops and plant nurseries but my favourites are still the ones that are upcycled, repurposed, and unique. It’s easy to get locked into the idea that we need to make our own art exactly like an example we saw elsewhere, but, if you can let go and innovate, you might just come up with something even better simply by making use of things you have on hand or can find dirt cheap at yard sales or thrift shops. Another place to grab ideas is online shops. You can see all sorts of things here on Amazon.com. Pick a favourite and see if you can make something similar. I’ll show you some favourite ideas. I took most of these photos on garden tours. 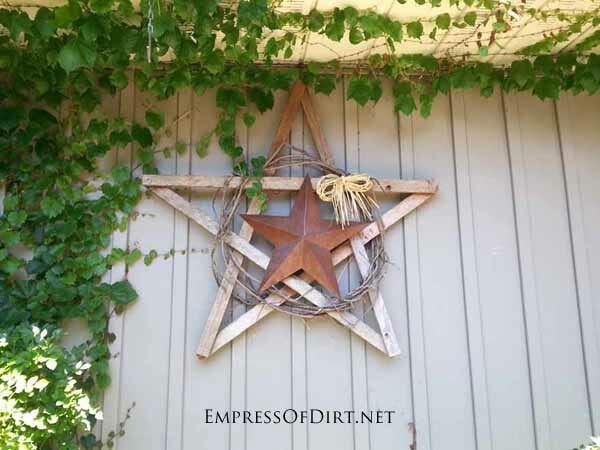 Create your own unique star with reclaimed wood slats, a grape vine wreath, rustic metal star, and a raffia bow. Have your plates and dishes seen better days? Let them live on outdoors. 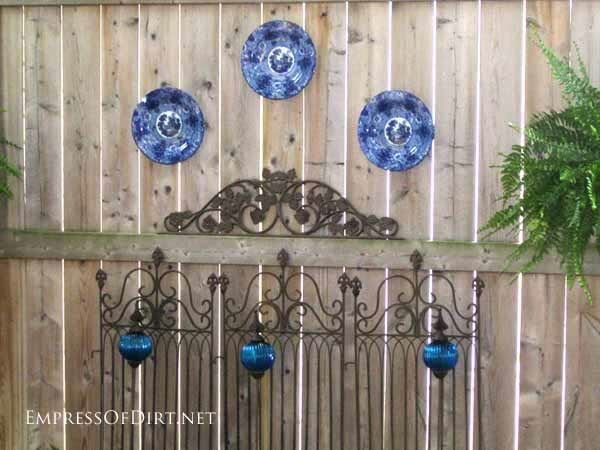 Here a collection of blue plates is combined with some metal art pieces and blue orbs. 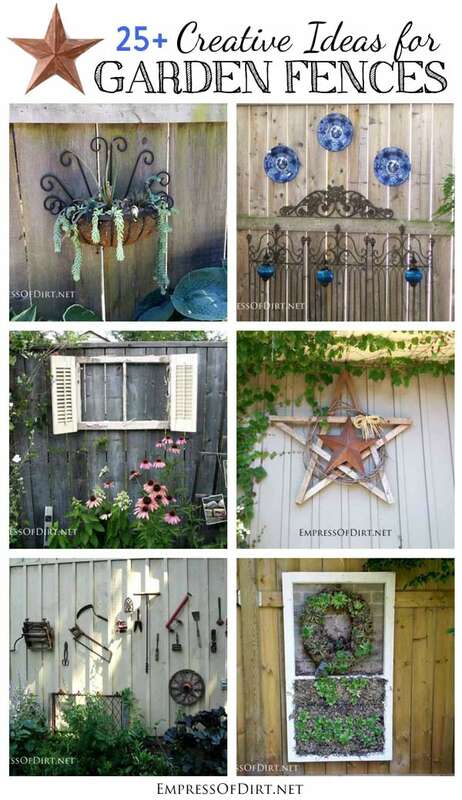 Several of these pieces might be kind of bland on their own, but arranged together on this fence they look quite wonderful. I often see boxes of rusty old tools at auctions. They’re filthy and there’s probably some useless junk in the box too, but if you’re willing to lug them home and clean them up, you can get a display like this for a real deal. 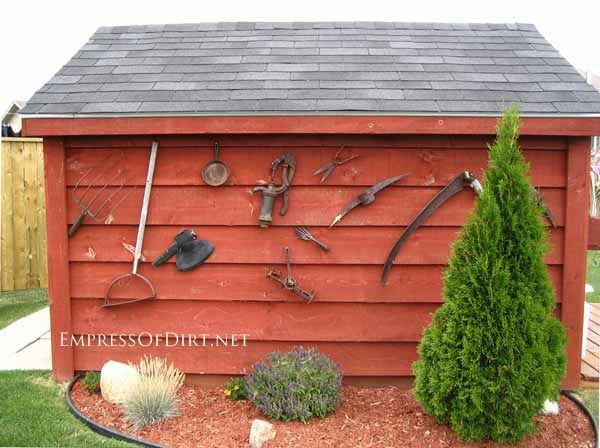 The side of this shed is used to display old garden tools, a cast iron frying pan, and more. So what works? I think it’s a simple of choosing items you like. If it appeals to you—hang it up. You can always switch things around later. Old gates, headboards, shelves—they all work. 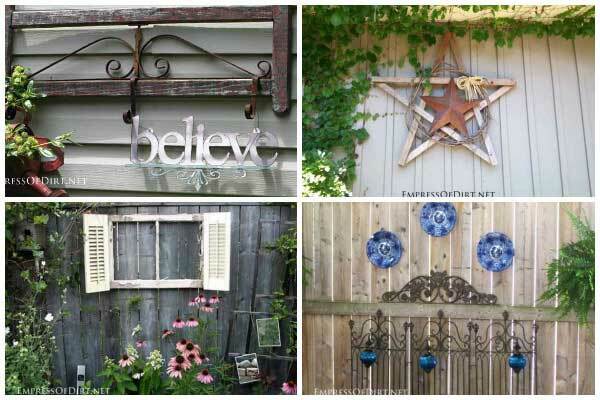 Add your own touch with a favourite metal sign. Here’s some examples at Amazon. Check thrift shops and yard sales to find ones in your area. If you have some favourite items you want to display but find them difficult to hang, add shelves. It’s a great way to show off bulkier items that you don’t want to keep on the ground. This is from my garden. 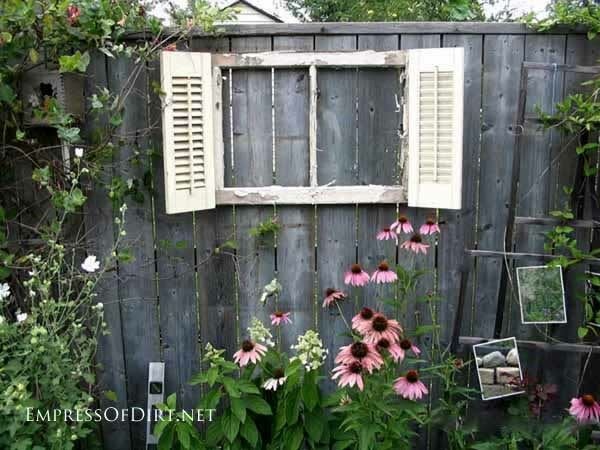 An old window frame matched perfectly with some junk shutters to create a focal point in the garden. 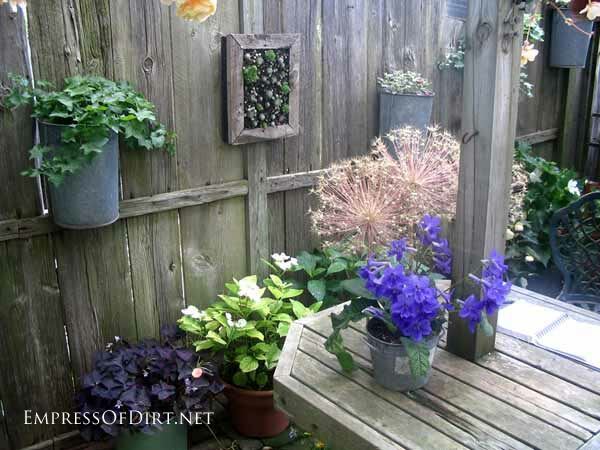 Along with some very sweet framed succulents, this garden has a series of galvanized buckets mounted on the fence. 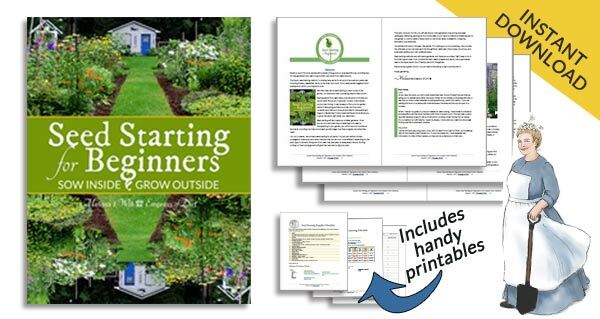 Simply drop potted plants in to change things up through the growing season. This is also at my house. 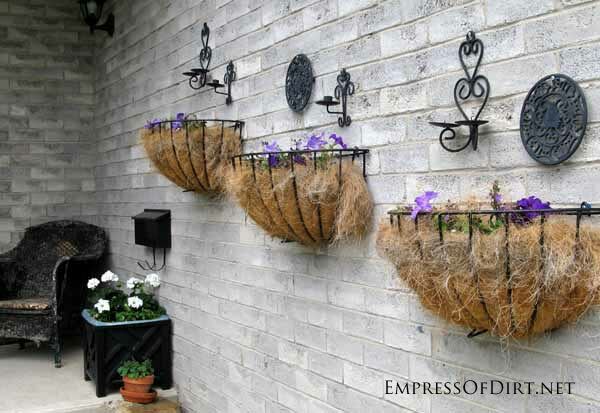 I added the hanging planters to add interest to the long brick wall but it still looked too plain. The addition of metal candle holders and kitchen trivets added the artistic touch I wanted. I hung these garden tools on the fence after realizing I was never going to use them but didn’t really want to get rid of them. While some love the look of rust, in this case I opted to spray paint the ends silver. 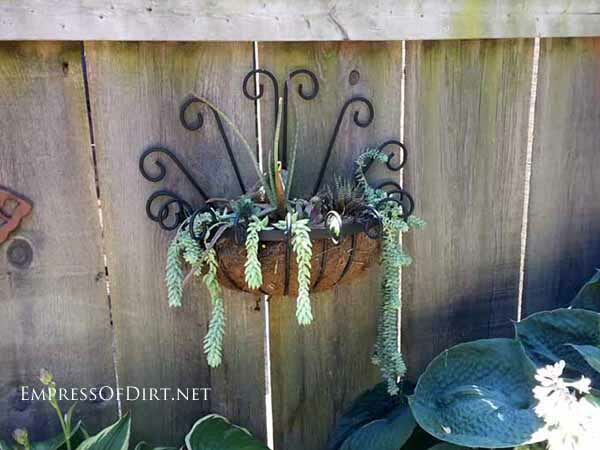 The succulents chosen for this fence-mounted planter are a perfect choice for the ornate style. Plus anything long or cascading tends to kick it up a notch. Display collections of similar items that work together likes these hanging metal sculptures. 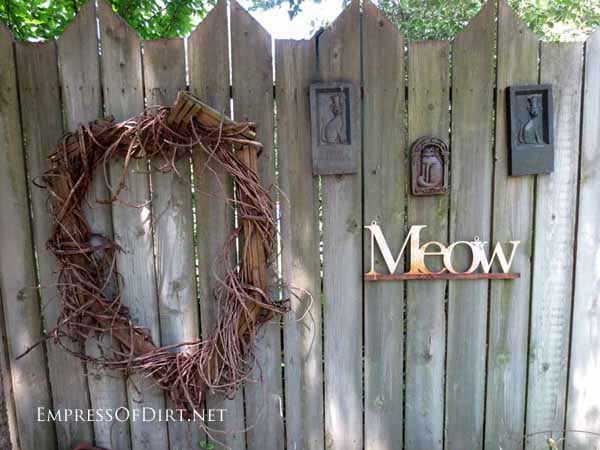 Here the gardener picked a theme—cats—and displayed the related items together. Meow! 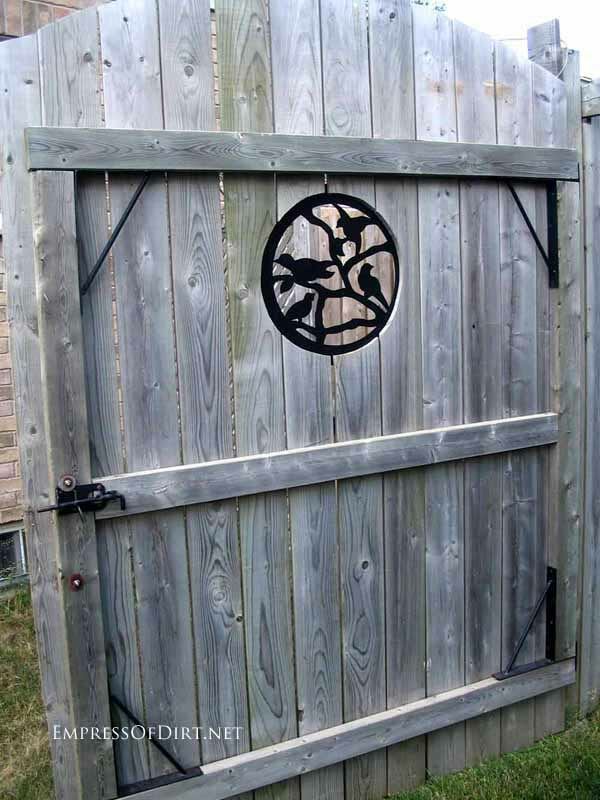 In the old days we used old floor grates for this but today you can buy metal or plastic inserts that do a good job of adding interest to a plain gate or fence. 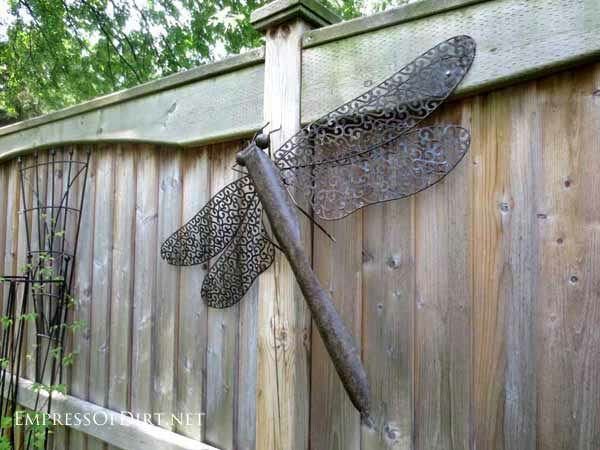 This giant dragonfly is from a shop but you can also make your own from an old ceiling fan. 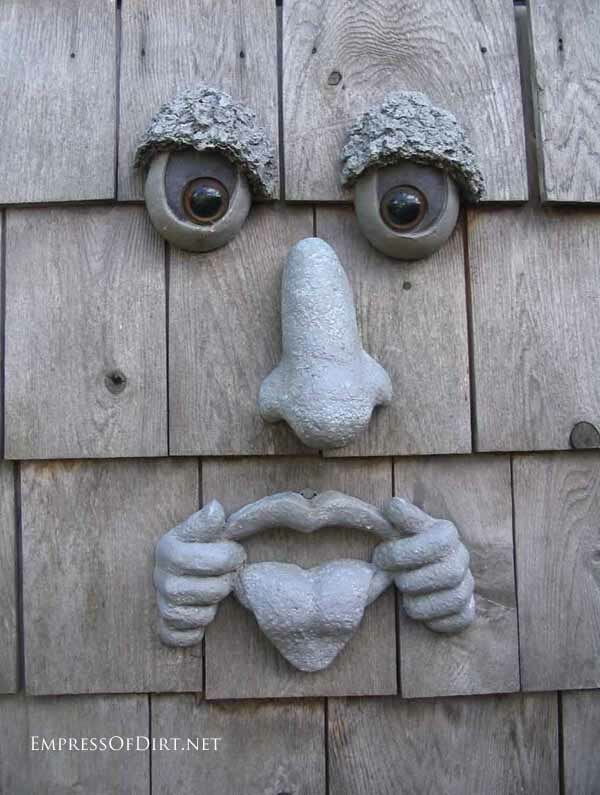 This unusual fence is between two houses where they wanted privacy and creativity. 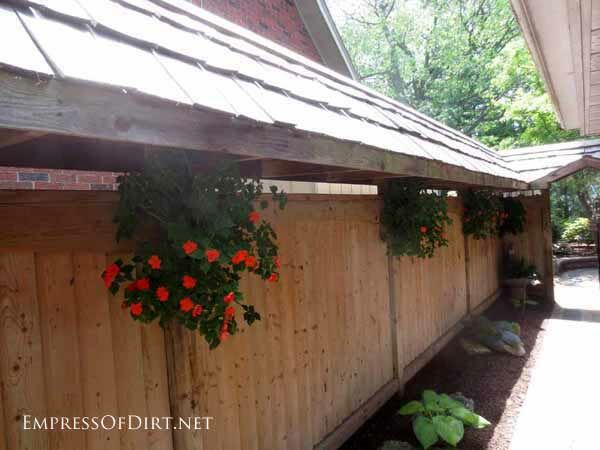 The “roof” up top is a smart way to add height to a fence without having a tall, plain wall. 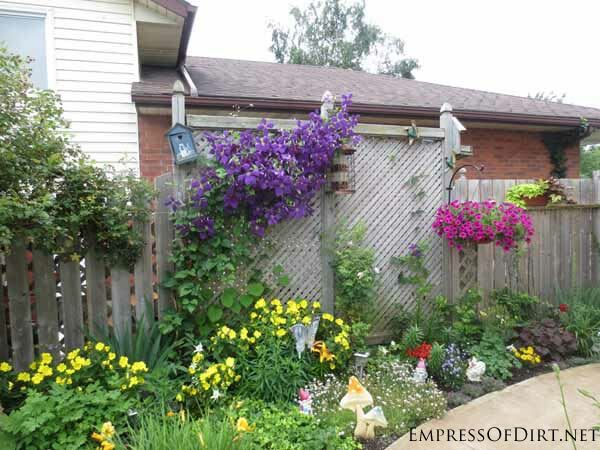 The repeated hanging baskets definitely bling it up. There’s nothing like a zing of colour to grab attention. These brilliant blues are a great distraction from a long, boring wall. This sitting area is set up the same way you’d do it indoors. The table and chairs set the stage, and the various plants and decorations on the wall accent the setting. 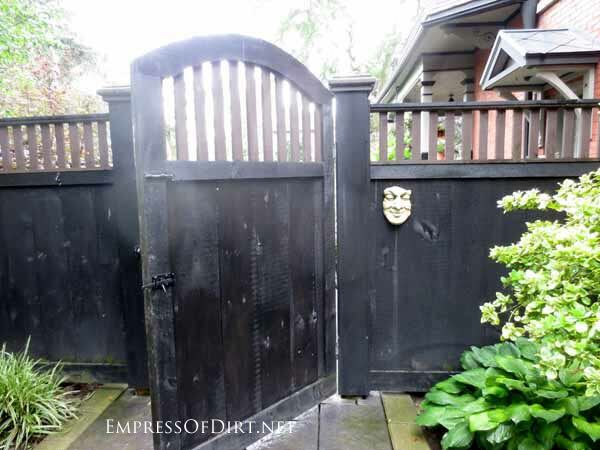 This little mask works perfectly on this expanse of black fence and gate. Simple touches like this are my favourite. 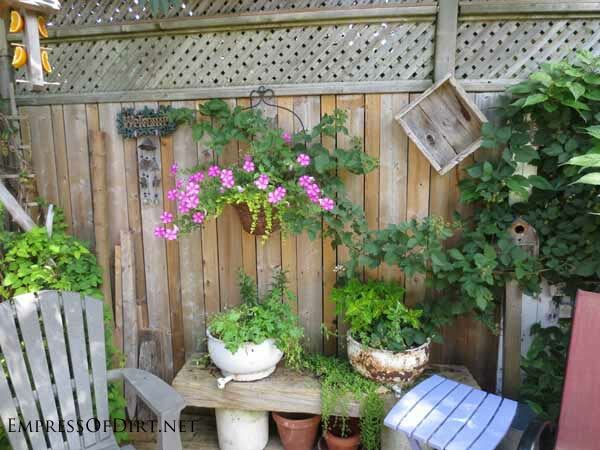 Train a clematis or other vine up a fence. 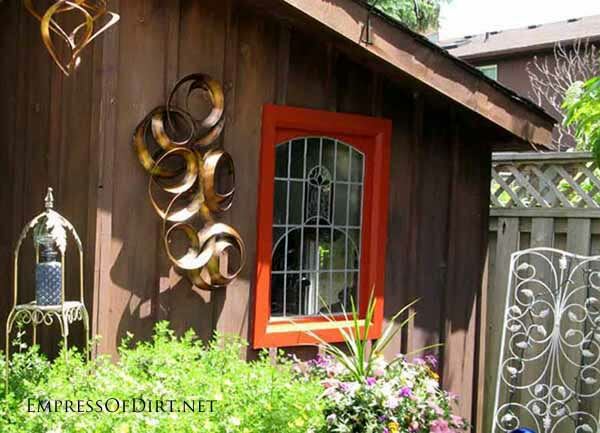 Here some annuals and birdhouses add to the living art. 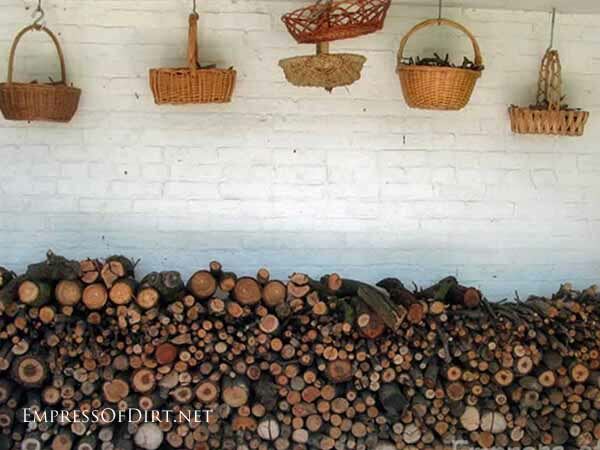 Stacked firewood and hanging wicker baskets look gorgeous together. Think about grouping items with similar colours and textures for an eye-catching display. I’m a big proponent of having your garden your way. Forget what anyone else has to say and follow your muse. If you like goofy faces like this or anything else that adds some fun, go for it. I hope you got some ideas you can use. There’s also a whole bunch more idea galleries here. Enjoy! I really like all of the different ideas you have for decorations! 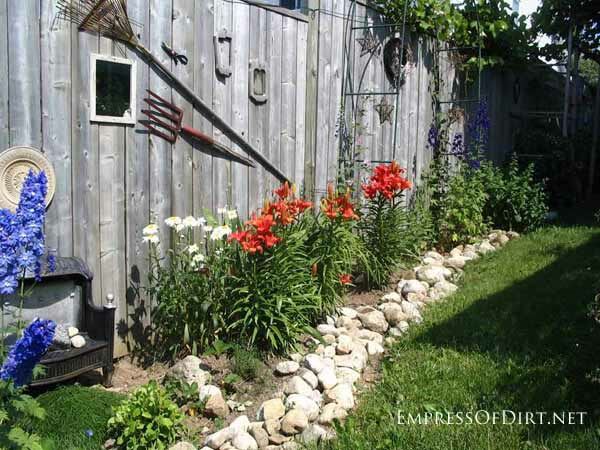 The wooden fence in my back yard seems so plain and boring so I’ll definitely need to see about incorporating something to make it stand out. The different plants hanging on the fence look great, is there every a problem with them not getting enough sun? 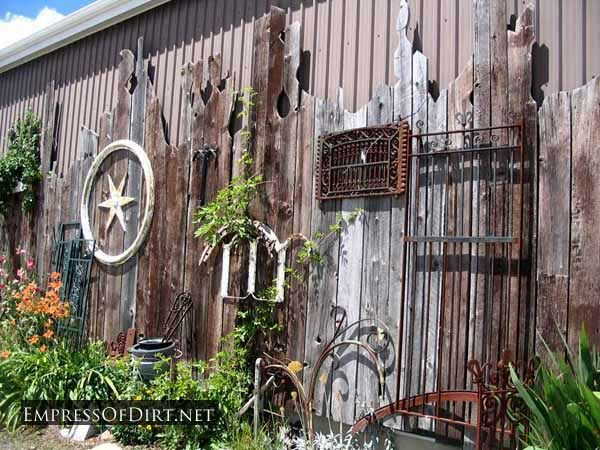 Love all the rustic metal art fence ideas. 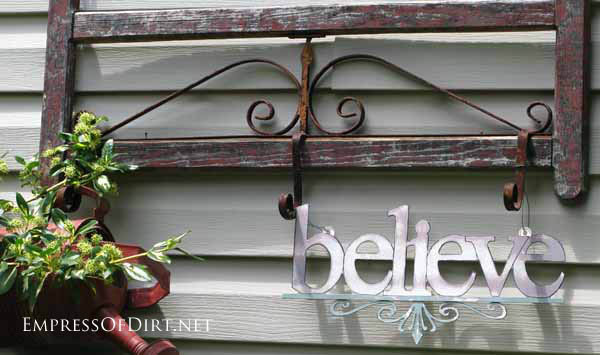 We love looking at your blog for our own inspirations and ideas for our own metal art work. Thanks! 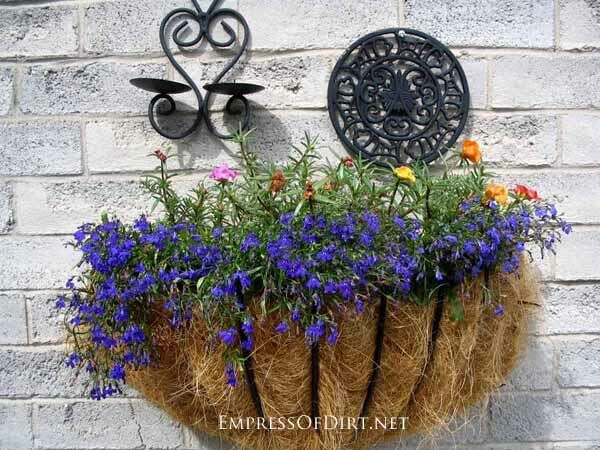 I think they look great on their own but you could also find objects to sit in the tops of them (flower pots, garden balls) and/or paint the springs. Lucky you to have them! 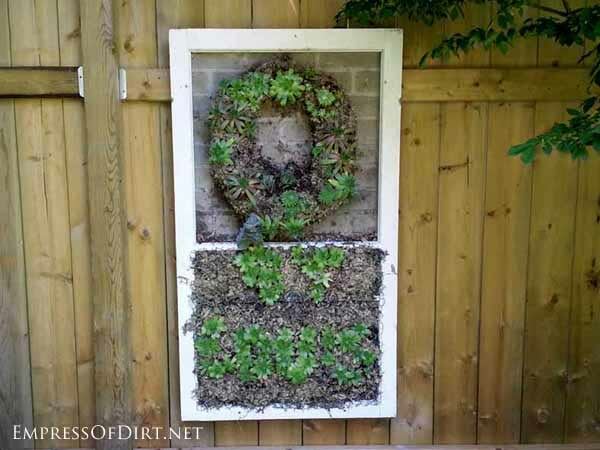 I love your garden décor ideas. Our house has siding on it, so I can’t be drilling holes all over it to hang decorations. So I make my own to put on stakes in the flower beds. Our fence is a boring chain link fence. Trying to talk hubby into some privacy fencing so I can make our back yard look alive instead of a boring yard with just 3 trees and a patio that has no life to it either. Thanks for sharing your beautiful yard with us! My yard in a newer area is bordered on one side by a plastic/ vinyl fence, neighbors fence not mine. So when your article today said ideas for fences I was quite excited. Notice how not one is plastic! 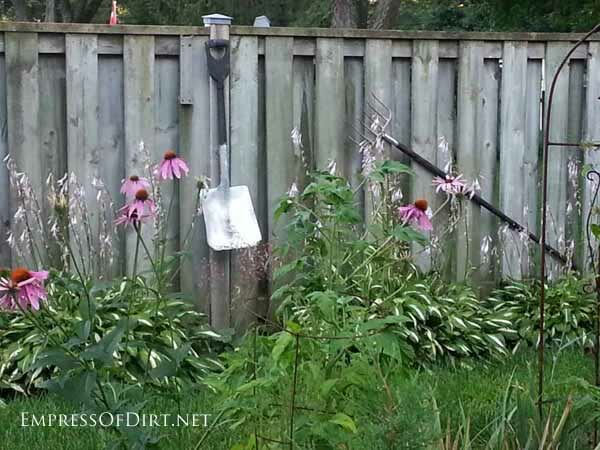 Right now I am thinking taller perennials and shrubs any other ideas. Should reach -50 tonight – I am remaining positive by “feel the heat in the sun now”, “the days are so much longer now” and ” March, in like a lion – out like a lamb”. One can only hope – and wait! Yikes, where are you that it reaches -50? Another great solution for plastic fences, if it’s affordable, is to use rolled bamboo or wilow fencing over top of it. Thanks for the decor ideas. Here’s one I did: on a walk through a wooded area under development, I found a rusty length of barbed wire–one if my favorite things from my childhood on a farm. I got some cutting tools and a large box and gathered up as much of the wire I could untangle. It was perfect for winding into rustic wreaths, attaching some old rusty bells, and a tie of red checked gingham or raffia. Hung outside of my shed window, it jangles in the wind, and reminds me of the farm, and of the adventure of finding the wire on my solitary walk through the woods on a fine sunny afternoon. Sounds wonderful – I love barbed wire too.